Summer fruit with oozing juice wrapped in golden, flakey pastry is every baker’s goal. Pie may be perfect, but crumble’s in. A crunchy-topped fruit crumble is welcome at any picnic, potluck or supper. When you’re at odds with the rolling pin and piecrust, stick with the rubbed together streusel mixture of brown sugar, butter, cinnamon spiked with plenty of rolled oats. Basically you’ll have a deep-dish pie topped with crumbly cake. It’s ready in minutes and not too sweet. With oatmeal and fruit it could be called a healthy dessert. Leftovers work for breakfast. I first met the crumble baked over apples in my elementary school cafeteria where it was dished up into pale green bowls. We poured over the cream from the top of our small bottles of non-homogenized milk and thought it was the most divine dessert. Kids willing to help clean up the lunchroom spooned up extra bits of dessert left in the baking pans as a reward. When I found this oatmeal version it became my standby. Try it with strawberries and rhubarb, blueberries and nectarines, peaches, pears with ginger, and don’t forget it during apple season. A plastic box of crumble topping stowed in the freezer, provides makings for a quick dessert at the last minute and crumble pressed into an empty pie plate bakes into oatmeal shortbread to break over ice cream with peaches. To mix in a food processor, combine flour, sugar, salt and cinnamon in work bowl. Pulse to blend. Slice over cold butter and pulse to form coarse meal. Pour into mixing bowl, and rub oatmeal in with your fingertips. Refrigerate crumble mixture in sealed plastic container. Combine rhubarb and berries with brown sugar in 2 quart (10-inch by 10-inch) shallow glass or glazed pottery baking dish. Strew crumble topping evenly over surface and bake in preheated 375°F oven for 30-45 minutes or until fruit is bubbly and crumble is golden brown. Serve with ice cream or whipped cream Enough for 8-10. I inherited an established rhubarb plant in my community garden plot. This is no fancy, red-ribbed variety; it’s the hearty, old- soldier, pink and green rhubarb, like those we remember near clotheslines in the back yards. It’s never daunted by harsh summers or record cold winters. It pushes up valiantly each spring with newspaper-sized, fan-like leaves, yard long fleshy stalks, and it flourishes in poor soil. My tomato plants may languish, but the rhubarb is king. In the past six weeks I’ve turned out strawberry/rhubarb pies, crumbles, compotes and jam. After I pulled out the bolting blossoms, it’s giving me another round. Rhubarb’s a native of Asia where it’s surely not known as the “pie plant,” and since it’s botanically a vegetable rather than a fruit, it must have traditional uses beyond dessert. Rhubarb offers the sourness we find in lemons, tomatillos, sorrel, yogurt that we add to meats and vegetables in many guises. 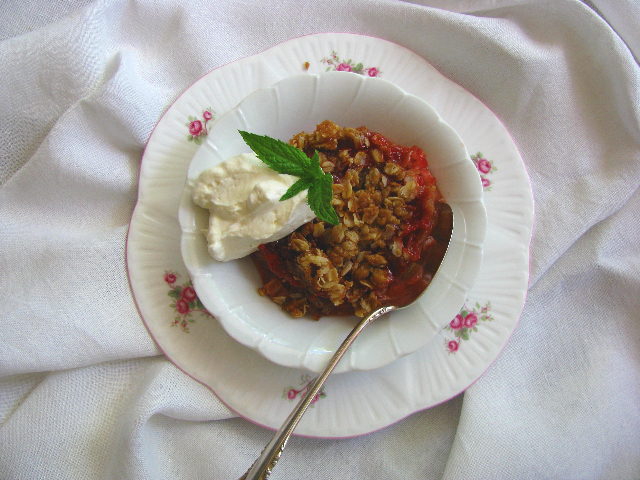 I’d never cooked rhubarb without sugar, but as I flipped though some books on Middle Eastern food, I found several recipes for a classic combination of rhubarb and meat in the Persian stew called Koresh. With some braising lamb from Sugar Valley Farm at hand and the rhubarb stacking up, I gave it a go. I felt uneasy until I tasted the finished dish which brought squeals of delight for its full, rich flavor and the fun in trying something new. Be brave; it’s worth tasting rhubarb as a vegetable. Trim lamb of excess fat and cut into bite sized chunks. Heat olive oil in a heavy enameled cast iron braising pot and brown lamb evenly. Remove, pour out any excess fat and sauté or sweat the onion to soften. Add garlic, chili and ginger. Cook briefly and add cinnamon, allspice, turmeric, preserved lemon, mint. Return lamb to the aromatic base, add about a cup of water, salt and pepper to taste. Cover and simmer 1–2 hours or until the meat is tender. Remove any bones or bits of fat. Add rhubarb and continue to cook until rhubarb pulps into the sauce. Taste and add a little brown sugar if the sauce seems too tart. Simmer to combine flavors. 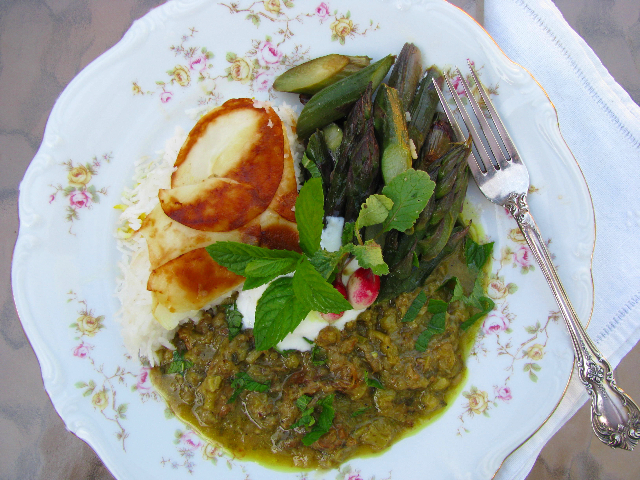 Serve with steamed rice, a dollop of plain yogurt and more chopped fresh mint. (Photo shows a potato-crusted chelo.) Enough for 3. You are currently browsing the Mary Jo's Kitchen blog archives for June, 2011.